Hello all! I am delighted to be joining Reverse Confetti as a Fetti Friend (I just love that name, so fun instead of the usual Guest Designer) for the month of February! Lots of fun projects and new products ahead! Today I’m participating in a Countdown to Confetti – its a sneak peek prior to the full release that will take place on the 8th of February (stay tuned). 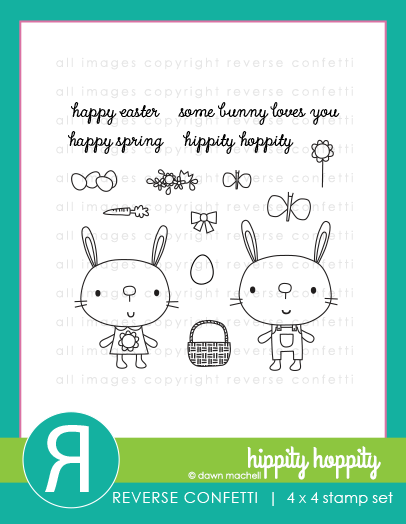 I made a cute little Some Bunny Loves You card using the new Hippity Hoppity Clear Stamps and matching dies as well as fun and colorful cards and edger dies from the new release. I really seem to be enjoying creating with little critters lately, they are too fun! I wanted to color my critters, carrots and eggs with Copics, but gave up that idea and used my Gansai Tambi Watercolor Set instead, so much easier and lots more fun if you ask me (I think I might need to update my Copic colors to be comfortable using them)! I also used a few of the new dies to create hills and the awning-like structure for the top of the card, love the little scallops. The sentiment, Some Bunny Loves You, was heat embossed in white onto a strip of yellow cardstock and foam mounted onto the card. I also added a couple clear droplets as little accents. Such a darling card! Love it!! Darling card Yana! Love it! a very cute scene you have created! Soooooooooo cute! Thrilled to have you joining us this month! Such a super sweet card, and I adore your use of yellow. I love this card! So many layers & elements. Great job! LOVE these sweet bunnies! The yellow makes it feel so fresh and fun! Some bunny will love this card, Yana! Absolutely adorable. I love the lightness of the yellow and green together. Great layout and welcome to Reverse Confetti. Great job! Love your adorable sweet card! Very springy and cute! Creative! The way you created the hills with the fun card panel is so fun! Also loving the edger die at the top of the card instead of the bottom. Bravo! So adorable! Can’t wait for Easter this will make a really cute card. Such a sweet card! Love the scene you created!!! Edger canopy at the top, and those sweet bunnies. Great card, Yana! Very nice! Love how you layered it ! Just as sweet as can be, love the scene you created!!! 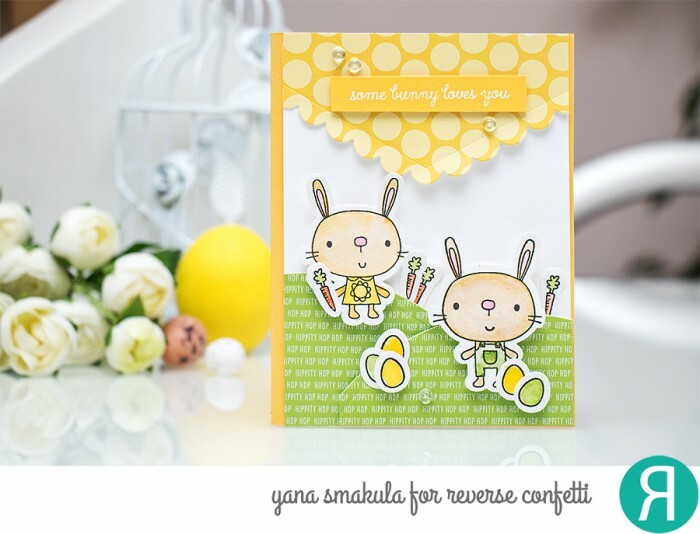 Such a great color combination on your cute Easter card! i love your use of the scallops on the card and the phrase”some bunny loves you”. So glad you’re one of the designers this month! Welcome! Cute little Easter scene! Darling card with those adorable bunnies! oh my! this is so cute. I love that you made hills with the rounded edgers. Another fabulous creation Yana! TFS! Such a great use of all this adorable product ! Thanks! 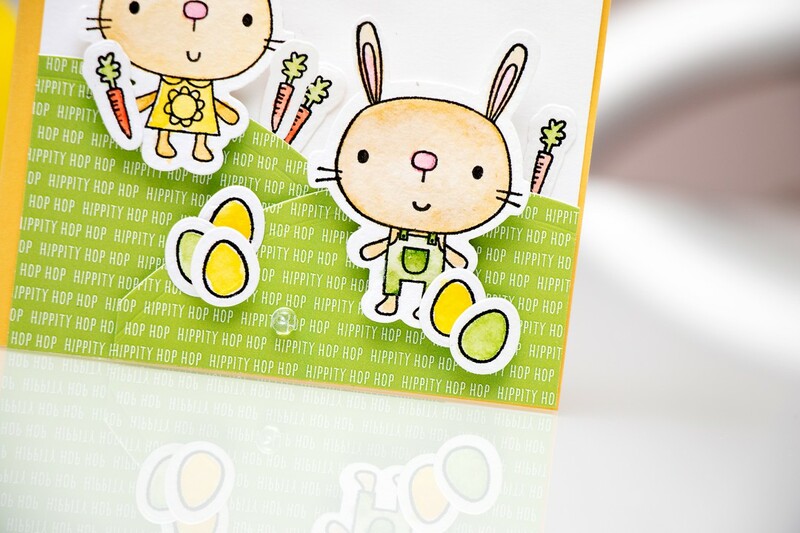 LOVE, LOVE, LOVE those bright Spring colors and using the Hippity Hop Quick Card Panels for the grassy hills? The perfect touch! The spring colors are perfect and the card is so cheerful! Oh, goodness… Love this! That yellow edging on top makes it all so sunshiney sweet! 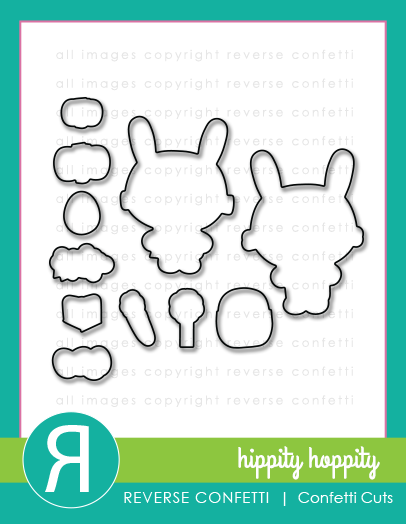 Adorable bunny scene you created. I like your choice of papers and the scalloped panel. So sunny! Love the paper you used for the hills…. Love how you used the printed paper for the grass… looks fab! Omg!! They are adorable!!! Such a fresh and cute card!! !